Pull out your handy dandy crockpot AND food processor. If you still don’t have these items, rethink your life. Invest. Period. Use the shredding attachment on your food processor and run both heads of cauliflower through the food processor to rice it. Throw all your riced cauliflower in the crockpot along with your chicken broth. Add cumin and salt and pepper to your rice along with 3 garlic cloves. 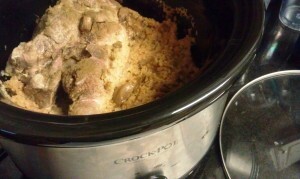 Now use a sharp knife to make 3 one inch cuts in the pork roast and push each clove into the roast cuts. Place roast on top of the cauliflower. Shred pork and mix with cauliflower rice! BOOM.